Provide better metrics to understand which groups of people engage and in what ways. Let’s take a closer look at what each of these are, and how you can start using Audience Optimization. 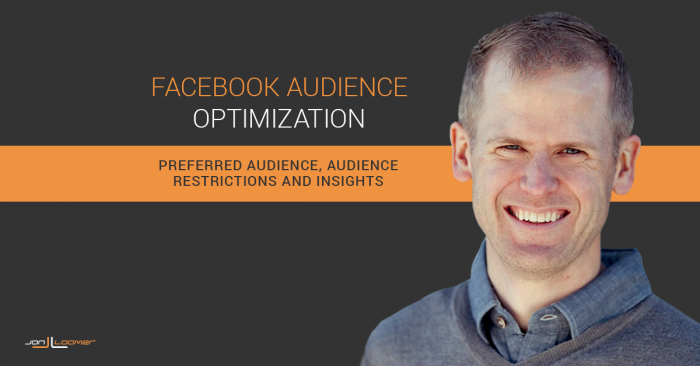 Before wrapping up, I also want to address some commonly asked questions related to Facebook Audience Optimization. As I type this, Audience Optimization is not currently available to all pages. It is available only for English language Facebook pages. If your page has more than 5,000 likes, Audience Optimization has already been activated and the tool should be available for you to use. Click “Edit” and check the box to activate it. When creating your post in the publisher, click the crosshairs icon to use this feature. Choose the people you’d like to reach in News Feed. People in this group are more likely to see your post. So it’s not that you are choosing to show your post only to your fans with particular interests. You are simply making it more likely that those people will see it. We’ll want to enter interest tags representing users who would be most likely to engage with our post. These tags will theoretically help Facebook better prioritize content in the news feed. 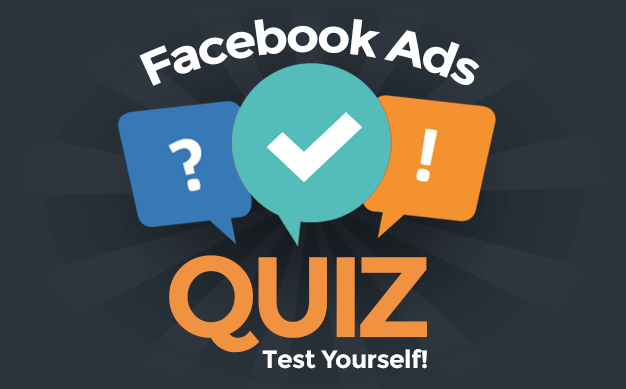 You can enter, browse for or get suggestions of interests from Facebook to target. Facebook can help you reach specific audiences by looking at their interests, activities, the Pages they have liked and closely related topics. You can choose up to 16 interests. 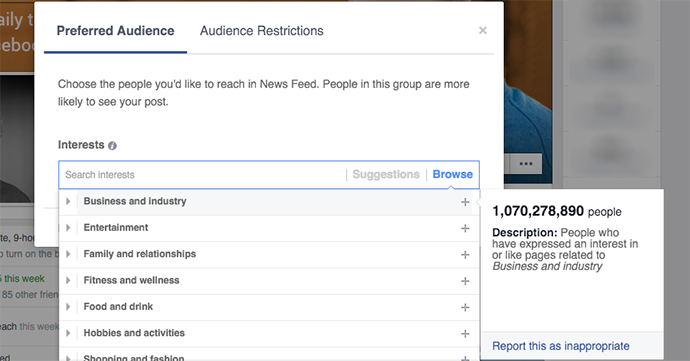 By clicking “Browse,” Facebook will bring up nine primary categories of interests to start with. Once you’ve entered your interests, click the “Save” button. Even if you want to click over to “Audience Restrictions,” you’ll want to save first or you’ll lose what you just did. We’ll get to best practices in a moment, but you’ll approach this differently than you would ad targeting. Keep in mind that this is not restricting your audience. The benefits are in both optimization and insights. Restricting your audience isn’t new, but it is now contained within Audience Optimization. 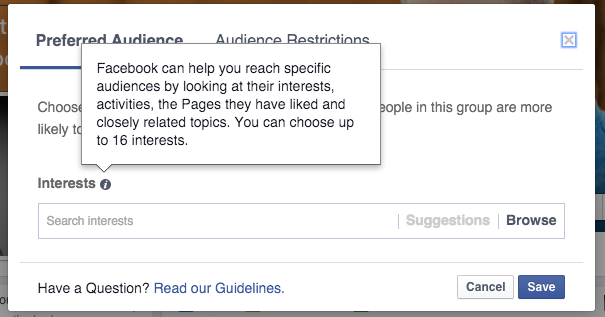 Recall that “Preferred Audience” allows you to tag interests to help Facebook prioritize which people see your post. There will also be significant reporting benefits to this later. Audience Restrictions, however, assures your post is seen by specific people only (based on age, gender, location and language). This is where Audience Optimization shines. Even if tagging content doesn’t lead to better engagement, it’s worth it for this bit of golden information. 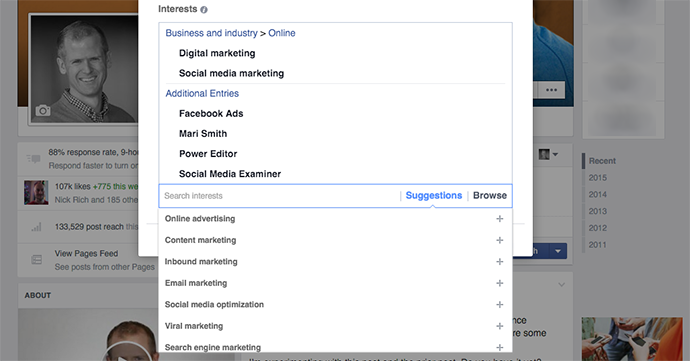 When you use interest tags, Facebook will then provide insights into how people within those interests engaged with your post. Before we move on, it’s important to make a distinction. 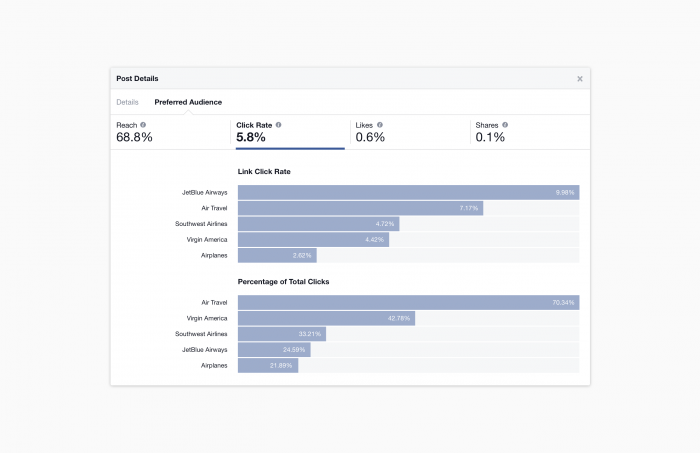 I don’t understand why Facebook calls this “Audience Insights” when they already have a completely separate tool within the Ads Manager called Audience Insights. It’s confusing! Within Insights of your page, click on a post that used Preferred Audience interest tagging. Then click on “Preferred Audience” to get insights into how people within those tags interacted with your post. The image above comes from Facebook. I just started testing this myself and have incomplete results, otherwise I’d share from my own page. You can click along the top headlines for Reach, Link Click Rate, Share Rate, and Like Rate for detailed information. In the example above, we can see that the Jet Blue Airways interest had a nearly 10% link click rate. Overall, the link click rate for all interest tags was 5.8%. It would be nice to see what the link click rate was for people outside of these Preferred Audiences, but this is still extremely valuable. This not only allows you to figure out which interests to tag in the future, it can also assist you with ad targeting. 1. Target audiences with relevant tags. Use tags in an attempt to define your audience. What types of people would care about your post? What are their interests? You’re looking to define the audience, not list keywords related to the post. 2. Tag with a mix of broad and narrow terms. 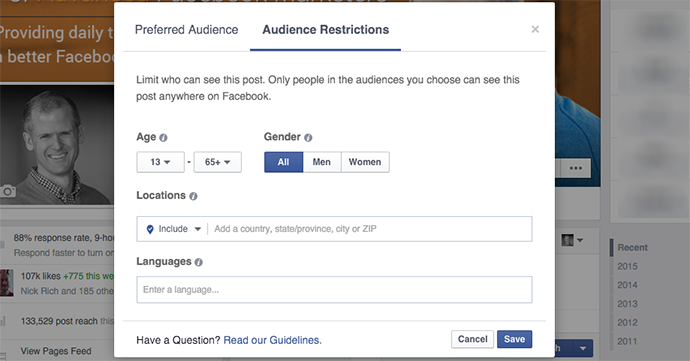 Facebook suggests starting broad and then narrowing to more specific audiences. However, avoid tags that are too broad like “Entertainment” or “Sports,” favoring subcategories instead. 3. Think associatively about related interests. Facebook suggests that you not limit tags to topics within the post itself. For example, you may want to tag a post about Hillary Clinton with “Bernie Sanders” because it may be of interest to that audience. 4. Consider including organizations and brands. Facebook suggests that you tag organizations and brands that may overlap with the subject matter of your post, even if they aren’t directly mentioned. 5. Use tags with small audiences strategically. Get specific if the audience is highly engaged and likely to be passionate about your post. 6. Save locations for relevant stories. If your content has local appeal, tag accordingly. 7. Use trending memes and hashtags. The suggestion of trending memes surprises me a bit since Facebook at one time punished memes in the news feed. However, the main point here is to tag related trending topics. How Should You Use Audience Optimization? First, use the best practices above as a guide. But feel free to experiment and find what works for you. Personally, I am going to start tagging my posts going forward. In the beginning, I expect to use 10-16 tags (broad and narrow) related to Facebook advertising. Over time, I will evaluate the performance of those tags. Which ones consistently resulted in a high engagement rate or high link click rate? Not only will these insights help me tag going forward, but they can also provide a guide for ad tagging in the future when using interests. How Is This Different From Interest Targeting? You may be familiar with the ability to target only specific interests within organic posts. That method is being replaced by Preferred Audience. 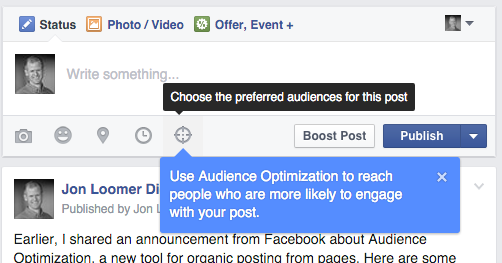 With the old method, only the people with the interests you targeted will see your organic post in their news feed. No one else could see it. Preferred Audience, however, helps prioritize your post in the news feeds of people with specific interests while not preventing those without those interests from seeing it. Possibly the biggest difference, though, is the added reporting provided for Preferred Audience tagging that was not available for interest targeting. Since you aren’t restricting your audience with Preferred Audience, this should not negatively impact your reach. In Facebook’s tests, they’ve seen that reach remains about the same while engagement goes up. This makes sense since Facebook will prioritize people with specific interests while not preventing others from seeing it. If you choose interests correctly, that should have a very positive impact. Does This Conflict With Ad Targeting? This has no impact. You can use interest tags on a post and then choose to promote that post with an ad to a completely different audience. When Will Non-English Pages Get Access? 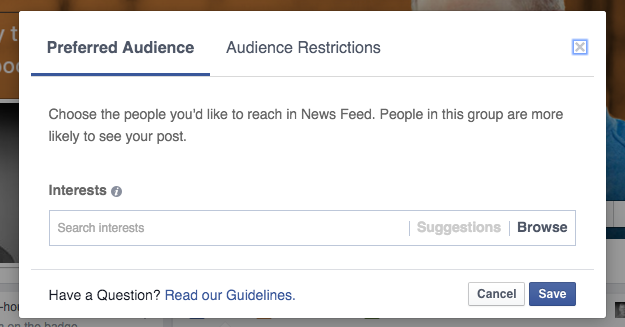 At this point, Facebook has no current plans to roll out Audience Optimization to non-English pages. Stay tuned! I have just begun to experiment with this tool, but I’m excited to see what can be done with it. What do you think about Audience Optimization? Have you started using it? What results are you seeing?